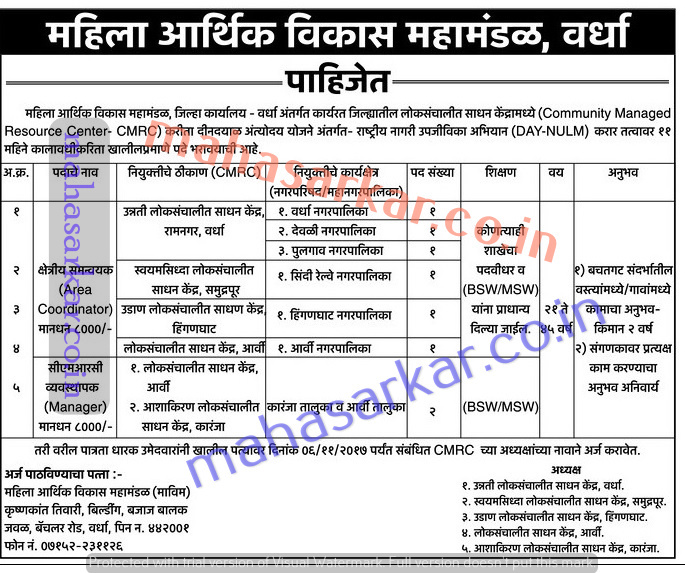 MAVIM Wardha (Mahila Arthik Vikas Mahamandal), Wardha Published Job Notification for 08 Area Co-Ordinator & CMRC Manager Posts. Candidates who wish to apply must look at MAVIM Wardha Recruitment 2017. Eligible candidates can apply offline before 06-11-2017. Education Qualification: Graduate/BSW/MSW and More.and More. For Post wise Education Details follow the detailed advertisement. Age Limit: 21 to 45 years. Interested & Eligible candidates can send their application along with all the necessary documents and testimonials to Mahila Arthik Vikas Mahamandal, C/o. Bldg. of Krishnakant Tiwari, Near Bajaj Balak Mandir, Bachlor Road, Samarthwadi, Dist. Wardha. Last Date to Apply Offline: 06-11-2017.